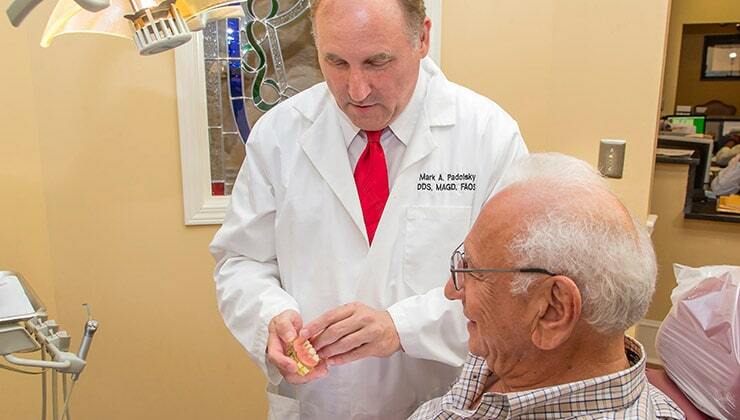 Dr. Padolsky is meticulous when it comes to creating comfortable, natural-looking dentures for his patients. Your dentures are planned with meticulous care and attention to detail by Dr. Padolsky. Dentures provide a convenient, economical and cosmetic solution to replace missing teeth. In recent years, technology has improved the look and feel of dentures making them more stable, comfortable, better-fitting and natural-looking. Dr. Padolsky enjoys making and placing dentures and seeing how satisfied his patients are when they can chew comfortably and look great with their new smile. He is very skilled and experienced and does an excellent job in creating esthetically pleasing, comfortable, custom-fitted dentures for his patients. Dr. Padolsky is meticulous when it comes to creating dentures that look good, function well and are comfortable. He will ask you to bring in a photo from when you were a young adult to use as a guide in creating your new teeth. This is to make sure that when you are wearing your new dentures, you still look like you. He takes all necessary steps to make sure your new dentures fit perfectly and are comfortable. Dr. Padolsky will first create your denture in wax so you can try it on and see how it looks and feels. Together you will customize the look and shape until it is just right. This attention to detail is what makes Dr. Padolsky’s dentures so great. Full dentures require the extraction of all teeth. They fit over your gums and are held in place with an adhesive. Partial dentures are held in place with metal clasps that attach to existing teeth which secure these dentures in place. With flexible, translucent no-metal partials, no one will notice you’re wearing a partial denture..
Implant-supported dentures are dentures that are attached securely to dental implants for added comfort and stability. We offer both removable implant-supported dentures that you can easily take out for cleaning, and fixed implant-supported dentures that are even more stable and can only be removed by the dentist. We do relines and repairs right in our in-office lab. We recommend using dental implants to stabilize your dentures. Dr. Padolsky prefers to use a minimum of four implants per arch for good strength. The more implants used, the greater the stability and the more lifelike they appear. With several implants per arch we can even do away with the false upper palate that covers the roof of your mouth. 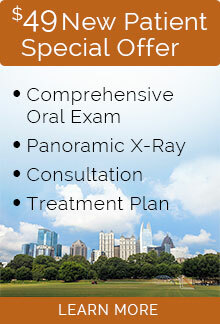 Dr. Padolsky offers a teeth replacement option for people who want as close to full chewing power as possible. With the same-day teeth procedure, you can get any needed extractions done, dental implants placed and temporary teeth all in the same day. This would be after all diagnostics and planning have been completed earlier. Same-Day Teeth are fixed-implant supported dentures. This means they do not need to be removed for cleaning or for sleeping at night. The dentures are screwed onto dental implants and can only be removed by the dentist. You care for them by brushing just like you would with actual teeth. Your new teeth are comfortable, stable and won’t move when you eat and speak.